One of National’s biggest election issues was that of migration. Key and his mates practically crucified the incumbent Labour government in 2008 over the continuing loss of New Zealanders to Australia. 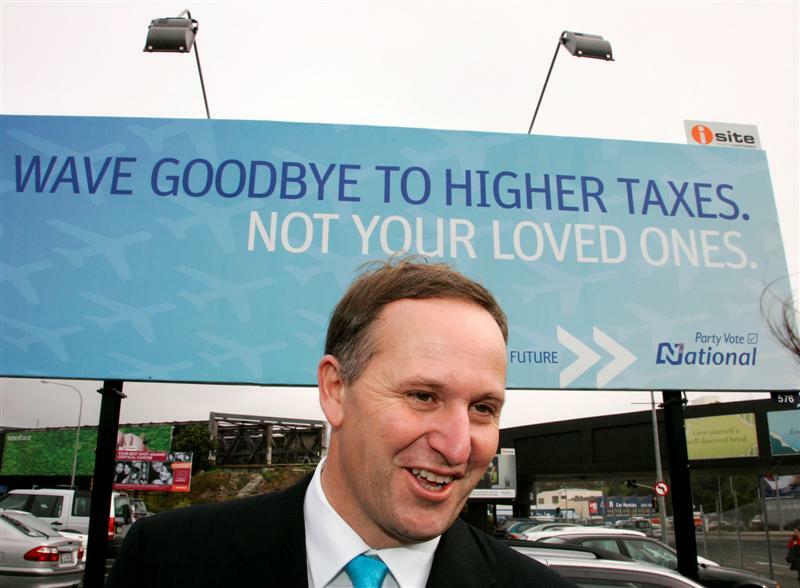 Even one of their election hoardings (see above) made the migration issue a prominent feature of National’s attack-advertising. “When the going gets this tough, is it any wonder that Kiwis look longingly at our Aussie cousins? Our Aussie cousins, who get paid a third more than us for doing the same job. Our Aussie cousins, who have been given a tax cut in every Budget for the past five years and who will continue to have their taxes cut for Budgets to come. In effect, National – led by our Smile & Wave Dear Leader – was promising New Zealand voters that they, alone, knew the secret to stemming emigration and the loss of New Zealanders to Australia and beyond. It was a bold committment to make to the electorate. Short of erecting a new Berlin-style wall; with armed guards; and patrolling gunboats to detain Kiwi boatpeople attempting to flee to Australia, how could National perform such a feat? Despite National’s rhetoric and attacks on Labour, their own track record in persuading New Zealanders to remain here and not leave for greener (or browner, in Australia) pastures was utterly abysmal. After four years of National, net migration to Australia (excluding other countries such as the UK, etc) has increased by ten thousand people more than under Labour. To be fair, migration involves factors that are often beyond the control of governments from either end of the political spectrums. The true issue here is not whether Labour or National or Uncle Tom Cobbly can stem migration. The real issue here is that National cynically exploited migration for purely selfish, political ends. They manipulated the public debate and exploited people’s concerns. This is why the public view politicians with such odium and distrust. Another issue here is that despite National’s right-wing reforms, tax cuts, and partial-asset sales/share floats – New Zealanders are continuing to vote with their feet. An increasing number of families and young people are departing our shores in a vote of no-confidence in John Key and his administration. It also suggests that the neo-liberal concept of the atomisation of “society” – replaced by the Individual and families – has reached it’s inevitable consequence. If all that matters is the Individual and their own needs, then concepts such as national identity and cultural heritage are hopelessly out-dated concepts. In which case, people will simply follow the money and nothing else matters. If we are ever to attract New Zealanders back to our country, and to persuade those already here that it is worthwhile being part of this society, then we have to move away from raw Individualism and self-interest. To encourage people to be a part of a society, that society has to be vibrant, strong, and offer more than just cash incentives. This is why National will never be able to reverse the outward flow of people and loss of talent overseas; the Nats are part of the neo-liberal paradigm for whom society will always take a back seat to the rights and primacy of the Individual. Key and his mob will always be trapped by their own neo-liberal dogma, and can offer us nothing except much hand-wringing; more excuses; and well-worn election rhetoric. Did this catch Dear Leader Key by surprise as well? I wonder – was John Key as surprised with this announcement today as he was a week ago, when the HLFS figures were recently released, revealing that unemployment was now at 7.3%? “ In the wake of the grim news about factory closures and lay-offs over recent months, the figures were only to be expected. Indeed, the warnings about a crisis in manufacturing have been coming thick and fast, and from all quarters. After four years of Key’s “leadership”, what do we have? ” Continuing bad economic news is prompting forecasters to speculate the economy may have gone backwards for the first time in two years. Retail figures for the September quarter showing a big fall in spending follow weak inflation and job numbers for the same period have been released in recent weeks. Westpac economist Michael Gordon says there is a reasonable likelihood the economy contracted in the most recent quarter. Deutsche Bank senior economist Darren Gibbs believes that at best, the economy failed to grow at all and possibly went backwards during the period. He said a manufacturing survey for October due in the next fortnight will give the first indication of whether or not the economy’s loss of momentum is continuing in the current quarter. Finance Minister Bill English told Morning Report that the numbers bounce from quarter to quarter and the latest figures are not of concern. It’s not just the low pay (which is being driven lower by National policies); nor the cost of housing rising higher and higher as a minority speculate on property for tax-free gains; nor rising unemployment; nor the growing wealth-divide. What is driving New Zealanders to escape – and I use that word with precise deliberation – is that our society has a strong impulse for self-flagellation that manifests as constantly making wrong economic decisions. Instead of looking at the long term – sufficient numbers of New Zealand voters opt for short term benefits. The result is that few of our economic problems are actually addressed in a meaningful way. The joke is that so many New Zealanders still hold a quasi-religious faith in the National Party as “prudent managers” of the economy. National is the last political body to earn the reputation of “prudent manager”. Any Prime Minister who reveals surprise at a worsening economic situation – despite data screaming “Red Alert! Red Alert!” on every indicator, is one who is asleep at the wheel and hasn’t a clue what is going on around him. How can a Prime Minister with an entire government department at his disposal, which spends $17,547,000 a year, be oblivious to 13,000 people losing their jobs in the last three months? Does he not read a newspaper? Or, as with the GCSB briefing in February, was Key simply not paying attention? Or perhaps, as with the John Banks police file, did he wilfully choose not to look at the information? Precisely why are we paying this man $411,510 each year?! One other reason why so many New Zealand voters are so deluded into voting for National; the old ‘aspirational middle class‘ thing. We all want to be affluent, succesful, and secure. The National Party is filled to the brim with millionaires, rich lawyers, businessmen and women, etc. Even Paula Bennett knew how to rort the welfare system when she was on the DPB, and bought a nice house with WINZ assistance. Mowst of us want that. So by electing National, some of that success will rub of onto us, right? 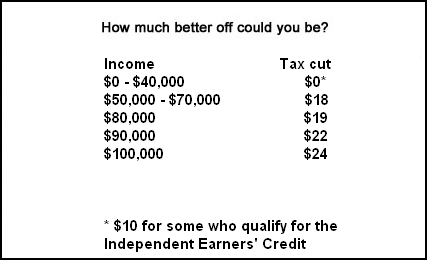 As the numbers above show, the higher your earnings, the greater your tax cut. Conversely, the lower your earnings, the less you got. If you earned $40,000 p.a. 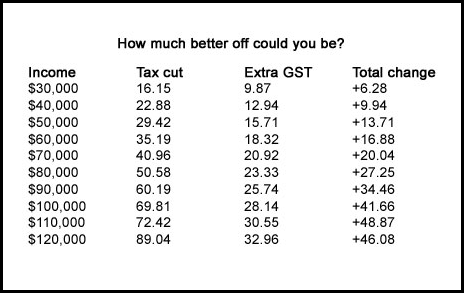 your tax-cuts in 2009 and 2010 was – $9.94. At the same time, GST went up. That meant you were now paying 15% on food, electricity, fuel (more actually), rates, etc. High income earners have done very nicely out of the tax cuts. “As part of the Government’s policy to spread the benefits of the mining boom, one million people will be freed from paying tax when the tax-free threshold is trebled from A$6000 to A$18,200. That is called re-distribution of wealth to those who need it. As compared to National’s re-distribution of wealth to those who do not need it. It takes a while for the Aspirationists to wake up and realise that they’ve been conned. In the meantime, Key smiles and waves and bats away serious economic problems; Paula Bennett targets and blames the unemployed for daring to be unemployed; Hekia Parata is busy undermining our education system; John Banks is throwing taxpayers money at private Charter schools; and the rest of the National Party are further dismantling our once egalitarian society, and doing dubious back-room deals with casinos, big business, foreign governments, and god-knows-who-else. The only thing that would really, really, really piss me off is that National voters became disenchanted with their own “government” – a mess of their own making – and headed off to Australia. To hell with that! been convicted of a drugs offence? been a part of a terrorist group? Ticking the last box should be grounds for immediate repatriation to New Zealand. The Aussies may already have started: I understand that Paul Henry is being sent back to New Zealand? National made a big deal of New Zealanders migrating to Australia. Essentially it became an election issue, with John Key painting our population loss to Australia as a “vote of no confidence” in the incumbent Labour government. 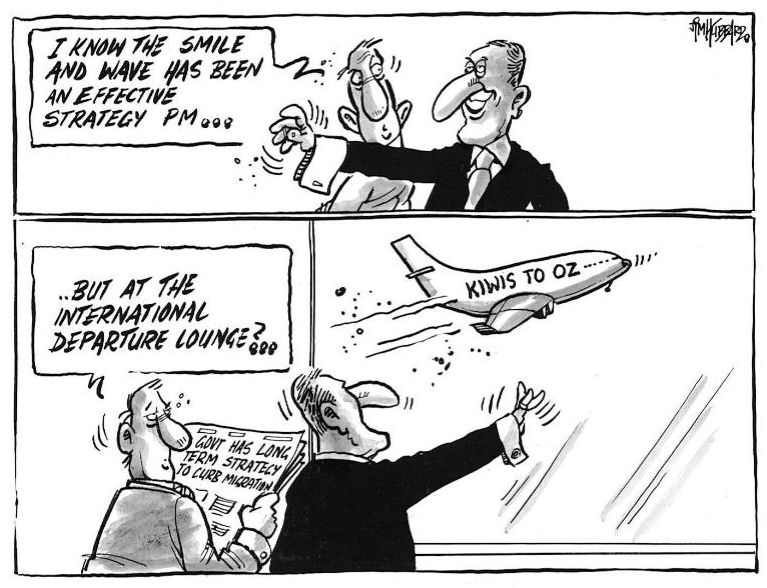 ” When the going gets this tough, is it any wonder that Kiwis look longingly at our Aussie cousins? Our Aussie cousins, who get paid a third more than us for doing the same job. Our Aussie cousins, who have been given a tax cut in every Budget for the past five years and who will continue to have their taxes cut for Budgets to come. Key and the Nats made a nice little ‘song-and-dance’ about the brain-drain to Australia. They pledged to voters that, once elected, would set about enacting policies to encourage New Zealanders to stay and help build our economy. Uh oh. Still not looking terribly ‘flash’, is it? Well, it’s only two years since the Tories were elected on a promise to engage with New Zealanders and create a country that, as Dear Leader Key said in January 2008, “we have to give them better reasons to stay“. Oh well. Maybe next year? Well, that seems to have flopped. Majorly flopped. So what is National’s response to such an utter failure of their policies? What new initiatives did Dear Leader and his well-paid, well-staffed Ministers come up with? So this is National’s ‘Plan B’? 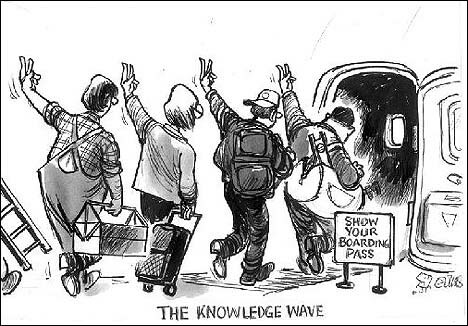 Instead of calling the mass exodus of New Zealanders a “brain drain”; lamenting the loss of our “best and brightest”; National’s spin-doctors (paid out of yours and my taxes) have re-labelled the slow de-population of our nation as a “brain exchange”?! Damn clever these spin-doctors, eh? Just imagine; the re-spinning of all our social and economic problems can be overcome in precisely the same ‘clever’ way. Just slap something with a re-label, and hey, ‘bob’s-your-aunty’. Except, it’s not ‘sorted’. Nowhere near ‘sorted’. Key is correct; New Zealand’s population continues to “grow”. But only because the rest of the global human population is only too willing to migrate to New Zealand from various Third World nations; poverty-stricken societies; and hell-holes like Iraq, Afghanistan, Sri Lanka, etc. This blogger has no problem with immigrants – my own parents escaped from an Eastern European nation after the Red Army rampaged through the capital city, shooting and killing. This blogger, does, however, have a problem with a Party that was elected to power on certain promises – and has failed spectacularly at every level to make good those promises. It is my contention that New Zealanders have ‘jumped the ditch’ – not simply because of the lure of jobs and higher wages in Australia – but because, as a nation, we have failed to instill a sense of belonging in many of our young people. Since the tsunami that was Rogernomics swept away many of our old values, and replaced our sense of nationhood with an odious philosophy of individualistic Me First, it is my contention that we have taught this generation to ‘follow the money’. Citizenship; a sense of belonging; and valuing and being valued, is way down on a list of priorities for many folk. Or non-existant. “ A Victorian-based Kiwi with a student loan debt, who did not want to be named because he did not want to be found by the Government, said he did not intend to pay back any of his student loan. I offer this salient piece of advice to Dear Leader andf the National Party; if we expect committment from New Zealanders – then, as a nation, we must show committment to our young folk, and to each other. That involves old fashioned concepts and values such as pride in our country. Not just our flag or rugby team or latest successful movie by Peter Jackson – but pride in a nation that invests in each citizen with universal, free education; food in schools programmes; decent housing; comprehensive free healthcare for our young people; fair wages sufficient to raise a family on; everyone paying their taxes (no exceptions for capital gains, sorry), and ensuring that no one is left behind. Our Scandinavian cuzzies have achieved this model of society. Even we used to have something similar once upon a time. Building a sense of nationhood, therefore, is not about building personal fortunes or buying the latest consumer gadget. After thirty years of experimenting with the doctrine of Individualistism and Me First, I think it’s fairly obvious that it has failed us. We may have state-of-the-art flatscreen TVs – but our kids are not watching them with us. They’re skyping us from Australia, or where-ever. If we want a sense of nationhood, it cannot be purchased; imported; traded on the sharemarket; sold; or commodified. It is something deep and innate within us that has to be nurtured by a sense of belonging. And judging by the exodus from these islands, you really have to ask yourself how strong that sense of belonging is, any more. Despite bribing us with two tax cuts, New Zealanders continue to migrate to Australia. No – “migration” is the wrong word. They are not just migrants, they are economic refugees. This is a mass break-out and escape of New Zealanders and their families for whom life in this country no longer holds any future. Far from “giving them better reasons to stay“, social ties to this country appears to be weakening. Is this the “Brighter Future” which our Dear Leader promised us? This is no plan for a “Brighter Future”. National is hell-bent on an ideological crusade to cut the state sector; cut taxes for companies and the rich – and then hope for the best. “Sustainable economic growth which creates permanent worthwhile jobs is best achieved by building a competitive economy that allows business to trade successfully with the rest of the world,” the Ministers say,13 March 2012 . We’ll be waiting an awful long time. Actually, some of us will be waiting. The rest are off. Why did the Kiwi cross The Ditch? During the Cold War, Eastern Europeans used to “vote with their feet” and escape to the West. Often that migration was done at great personal risk to themselves and their families. The Poles, Hungarians, Czecks, East Germans, et al, who crossed from the Eastern European Zone did so in search of freedom – political, economic, and social. For them, the repression in their home nations was sufficient motivation to up-root and leave behind family and friends, in search of something better. Unlike their Eastern European cuzzies, New Zealanders are not leaving simply to improve their financial lot (though that certainly plays a major part). I believe there is much more involved in the psychology behind this migration. 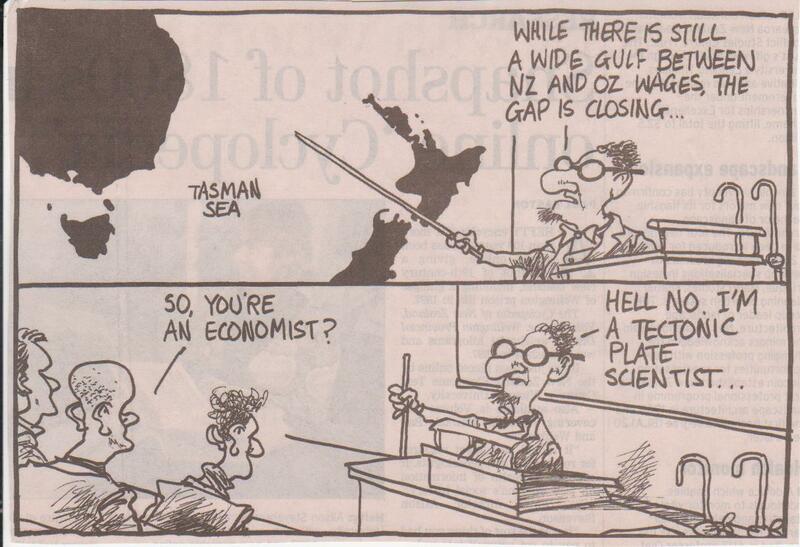 Since the Rogernomics New Right “reforms” of the late 1980s, New Zealand has been socially re-engineered. New, neo-liberalistic values of obeisance for wealth; state sector “efficiency”; low taxes; minimal government; user pays in many, previously free social services; and a quasi-religious intolerance of those at the bottom of the socio-economic scale who are left behind in the mad scramble for money and status. A new creed of Personal Good trumps Social Needs, and Individual Rights/Needs trumps Community Well-being. It is a New Right puritanism that demands solo-mothers (but not solo-fathers) “go out to work” – blind to the concept of raising a family as being a vital form of work. It is the demand for Individual Rights to have 24/7 access to alcohol – irrespective of harm caused to society (see BERL report) and the eventual cost to tax-payers. It is a nasty streak of crass, moralistic judgementalism that blames the poor for being poor; invalids for being born with a disability or suffering a crippling accident; solo-mums (but not solo-fathers) for daring to be responsible enough to raise a family; and the unemployed for being in the wrong Place/Time when the global banking crisis metastasized into a full-blown worldwide Recession, turning them from wage earning tax-payers – to one of crony capitalism’s “collateral damage”. In all this, having a sense of community; of belonging to a wider society; and of being a New Zealander – has been sublimated. Except for ANZAC Day; a national disaster; and when the All Blacks are thrashing the Wallabies, we show very little sense of nationalistic pride or social cohesion. Indeed, I recall some years ago being in a 24/7 convenience store in downtown Wellington, on ANZAC Day. It was not yet 1pm, so by law alcohol could not be sold. I noticed a customer in the store selecting a bottle of wine from the chiller and taking it to the checkout, to purchase. As per liquor laws, the checkout operator could not legally sell that bottle of wine, until after 1pm. The operator explained that it was the law; it was ANZAC Day; and it was a mark of respect (most shops weren’t even open before 1pm). And that, I believe sums up our present society. That young man simply didn’t care. He wanted something and he couldn’t believe it was being denied to him. To him (and others like him, who usually vote ACT and/or National), all he knew was that he WANTED a THING and his right to have it, if he could pay for it, was paramount. What does that say about a society? Firstly, what it says is, to some folk, a society is little more than a flimsy, abstract concept – and not much more – with ‘Society’ being subservient to the demands of the Individual. Secondly, if Society is nothing more than an abstract concept – as one person recently wrote to me on Facebook – then there is no way whatsoever that an individual can feel a sense of “belonging”. “Belong” to what? A geographic place on a map that happens to have a different name and colouring to another geographic place adjacent to it? If people who happened to be born in a Geographic Area; designated “New Zealand”; coloured pale-green on the map; decide that they can earn more money in another Geographic Area; designated “Australia”; coloured ochre on the map – then moving from “A” to “B” is nothing more than a logistical exercise. Kinda like shifting house from one street to another. When we have no concept of “society” – then people will “vote with their feet”. They simply have nothing else to consider when making a decision except solely on material factors. If we extrapolate this situation to it’s logical outcome, it becomes obvious that New Zealand’s future is to become a vast training ground for the global economy, with thousand of polytechs, Universities, and other training institutions churning out hundreds of thousands of trained workers for the global economy. Our children will be born; raised; schooled; educated; and then despatched to another Geographic Area. It gives a whole new meaning to Kiwis “leaving the nest”. “We know roughly what the recipe is, policies that support business that want to employ and create opportunities, that provide people with skills and reward those skills. … he was quite correct – though not quite in the way he was intending. New Zealand will “provide people with skills and reward those skills” – just not for this country. Dear Leader really should stop smoking that wacky baccy. It’s all utter rubbish of course. The economy is not “growing at a faster rate than Australia” (except in Key’s fantasies) and rather than “closing that after-tax wage gap” – it’s actually been widening. Worse than that, employers – with support from National – are actively engaged in a “class war” against their own employees to lower wages and to destroy workers’ rights to bargain collectively through a Union. The lockout of AFFCO workers and threat by Ports of Auckland Ltd to casualise and contract out their workforce is nothing more or less than a campaign to reduce wages and increase profits for shareholders. Not a very pretty picture… and yet that is the future we seem to be creating for ourselves. How do we go about undoing the last 27 years of free-market, monetarist obsession? Do New Zealanders even want to? We should care – quite a bit, in fact. The more skilled (and semi-skilled) people we lose to another Geographic Area, the fewer taxpayers we have remaining here. Those taxpayers would be the ones who would be paying for our retirement; our pension; and caring for us in Retirement Homes up and down the country. Which means, amongst other things, that we’d better start paying Rest Home workers a more generous wage rather than a paltry $13.61 an hour – or else we’ll be wiping our own drool from our mouths and sitting for hours on end in damp, cold, incontinence pads. Even semi-skilled workers contribute more to our society than we realise. If we want to instill a sense of society in our children – instead of simply living in an “economy” or Geographic Area – then we had better start re-assessing our priorities and values. We can start with simple things. Like; children. What is more important; a tax-cut, or providing free health-care and nutritious meals at schools for all children? Children who are all well-fed and healthy tend to do better at school. They learn better. They succeed. And they go on to succeed in life. But more importantly, if society as a whole looks after all children – irrespective of whether they were lucky enough to be born into a good family, or unlucky to be born into a stressed family of poverty and despair – then those children may, in turn look after us in decades to come. If we want our children to feel a part of a society – our society – then we have to instill that sense of society in them at an early age. We’ve tried everything else these past three decades – and things aren’t getting better. The focus on materialism and Individualism has not delivered a better society, higher wages, or other beneficial social and economic outcomes. Instead, many of our fellow New Zealanders are turning away and going elsewhere for a better life. Quite simply, if people are Voting with their feet, then this is a Vote of No Confidence in our country.